Bungee Jumping, Cabo San Lucas - What a Rush! Get ready for the thrill of your life! The most adrenaline-pumping extreme sport in Cabo San Lucas is our bungee jump. From high above the canyon floor, in our custom glass-floored gondola, you'll confront your fears head-on, close your eyes, and GERONIMO!!! 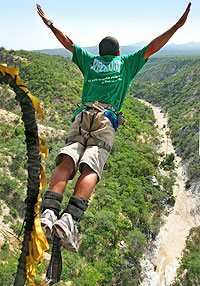 The only bungee jump in Cabo takes place out at Wild Canyon Ekopark, home of the Flying Tortuga Monster Zip Lines and exciting Fox Drop Rappel. You can do all three activities conveniently in one day of thrilling excitement, or you can just do any one or two of them. After you've had enough excitement for one day, you can relax and share photos and stories at the onsite Lion's Den restaurant. What a ride! Extreme Combos: Add Zip Lines, Sling Swing, Green Zebra or Rappelling at a discount! Click Here! Cruise Passengers: Yes! This tour makes a great shore excursion. There's a special time slot just for you! Three times daily at 9:00 AM, 12:00 PM and 3:00 PM. Complimentary Pickup and Dropoff at Your Hotel, the Cruise Pier in Cabo San Lucas or at the tour office on the marina. Hotel Pickup and Dropoff (in most cases), Expert Bilingual Guides, Safety Briefing, Gondola Ride Tour, Bungee Equipment, Water, Visit to Animal Kingdom Wildlife Sanctuary. Ages 8 and up. Must be at least 90 lbs (40 kg). Kids same price as adults. Weight Limit is 240 lbs. (110 kg.) For safety reasons, people with a history of respiratory, back, neck or cardiac problems or osteoperosis and pregnant women are not permitted on the tour. Guests must be able to walk in mountainous terrain for up to 15 minutes. For your own safety, we don't allow cameras during this tour, only before and after. Your cruise ship doesn't offer this, but you can book it here! If you have an observer, please specify in the "special instructions" box when booking. $30 per person charge is paid in cash on the day of the tour. Note: The 10:30 AM slot is only available to cruise passengers. In the hot summer months, pick the 9:00 AM tour to beat the heat.